Jupiter, FL – January 29, 2019 – Guanabanas Island Restaurant and Roots Music, Inc. have for a decade plus teamed up to bring the North Palm Beach area an eclectic offering of live music.On February 27, 2019, they will present perhaps one of their most diverse lineups yet: iMayday!, RDGLDGRN (red, gold, green), and LittleStranger, three groups that span multiple genres. They will grace the stage located at 960 North Highway A1A Jupiter, FL 33477 beginning at 8 p.m. Show is free; 21 over are welcome. “We’re more than excited about the trio of musical acts set to come through here in late February,” says Talent Buyer Matt Cahur. “You can’t really do better than iMayday! as far as South Florida-grown hip-hop is concerned, and I am stoked to finally get them at the venue. 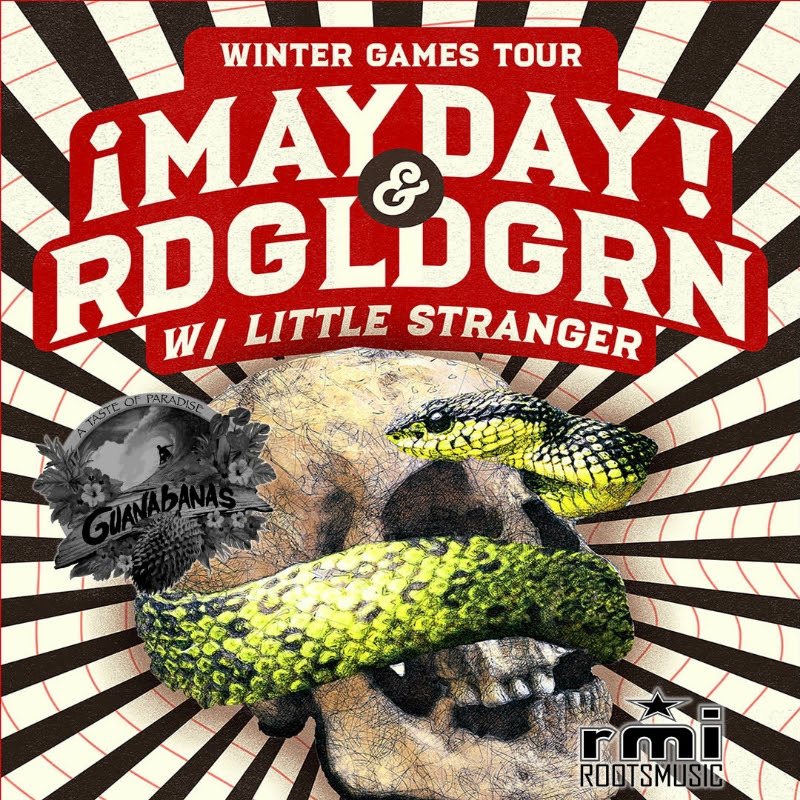 RDGLDGRN’s sound is infectious; and Little Stranger’s opening set will be like icing to this musical cake.” Cahur is the Roots Music head who is responsible for booking all of the live music at Guanabanas. He’s also the lead sound engineer and is himself a guitarist. iMayday! sprang from a Miami, FL suburb called Kendall in 2006, achieving initial notoriety with a viral YouTube hit called “Groundhog Day”, which featured DJ Craze and Cee-Lo Green. They eventually signed to rapper Tech N9ne’s label Strange Music, and have subsequently issued six full-length releases on the imprint, including their latest, South of 5th in 2018, which debut at number one on the Billboard reggae chart. Additional information: www.maydayonline.com. RDGLDGRN hail from Reston, VA. The group first came to prominence with the release of their 2011 single “I Love Lamp”, which got them noticed by industry heavies such as DaveGrohl, who drummed on their eponymous 2012 debut EP, PharrellWilliams, who co-wrote and produced a track for same, and producer KevinAugunas. They are currently putting the finishing touches on their next release, which is being produced with the help of a PledgeMusic crowdfunding campaign. More details at www.rdgldgrn.com. The brothers from other mothers John and KevinShields comprise the quirky Philly by way of Charleston indie duo known as Little Stranger. They are all about originality, with every song being a separate work onto itself, making them inhabitants of a relatively unexplored niche of alternative / hip-hop. Visit them online at heylittlestranger.com.